Scope – As a team member of Oakgrove Construction, a reputable local road & bridge contractor, Kandey was subcontracted for the relocation of the existing 16” water main in conflict with new bridge foundations. A large portion of this relocation involved a 30” diameter jack and bore for s new 16” ductile iron main approximately 310 LF in length. Kandey utilizing their newest 30” guided steering head completed the 310 LF case bore on target and ahead of schedule. 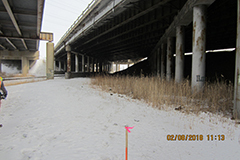 The balance of the project involved installation of 16” restrained ductile iron piping encased in steel casings beneath the bridges and then final interconnects to existing 16” main.